The Ghost Bikini definitely takes the beach series in a fresh new direction. I can safely say that this is a good thing because the beach environment got stale the instant it was introduced. This film actually manages to stay classy for the most part. We still do have some random party moments but you can’t really compare it to the last few films. It’s not all there yet, but this movie makes some real progress. The film starts off with a ghost heading over to a coffin and waking the inhabitant up. It’s a tragic day for him since the ghost who was his friend died young while he died as a senior. The only way they can live together in the afterlife at the same age will be if he can perform one good deed. The issue is that the guy can’t actually leave the room so he has to trust Cecily to carry out the deed for him. Fortunately the crew (aka, the beach gang) are heading over to his house for some reason. A bunch of other people will also be there including the lawyer Ripper who has to read the will to a select group in order to claim the money. He enlists the help of a bunch of villains in order to destroy the competition so he can take all of the money. It’s a very ambitious plan and while this may sound bold, I think Ripper may be able to claw out a win here. I would definitely say that this is the best of the beach movies. Mainly this is because the beach itself doesn’t actually get to show up this time. At most the kids quickly run to the pool and that scene isn’t too long. The opening is actually like something out of a horror film as the two suspicious characters make their plans amidst a lot of spooky music. Since most of these films had horrible beginnings this was a welcome surprise. Naturally this was thrown out the window once the beach characters showed up to bring along all of the baggage that comes with such a setting. It never gets quite as bad as in the previous films which is why this film’s score is a little higher, but it still makes enough mistakes to keep it from being negative. For starters, the film seemed to grow bored of its own plot and so it kept on adding a bunch of new ones. None of the plots are ever focused on in a satisfactory way at all so in the end you are left feeling betrayed by the movie. For example, what even was the good dead of the spirit? Okay, he’s stopping his lawyer from cheating on his will, but that directly benefits himself and shouldn’t count. He has fun watching the characters get scared and fall into his traps, but he doesn’t do anything beyond that. The whole plot felt absolutely directionless. Also, from the start Cecily is subtly mocking the old man and seems to have a sinister plan up her sleeve. Well, the ending arrives and the rather predictable twist occurs, but it felt like a rather underwhelming climax to what was a very long build up. It’s also worth noting that while Cecily appears quite a lot, she doesn’t actually do anything. Take her away from the film and very little changes. She mainly just gives people subliminal messages. It seems like she can interact with both inanimate objects and people so Cecily could probably have done a little more here. It’s the kind of film where it seems like the writers wanted to incorporate the title into their film somehow, but didn’t actually think about it until the end. The whole ghosts angle ultimately just felt like a really big waste. Then we’ve got Ripper and his gang. He has quite a few henchmen. So many in fact that half of them never really get to do anything. Ripper is the only competent member of the group as he actually does stab someone and the film hints that the victim stayed dead. Ripper basically has to do everything himself so it is easy to feel bad for the poor guy. From his minions Sinistra gets the biggest role so it is safe to say that she looks the worst. She can’t see without her glasses and always tends to lose them. As a result she ends up murdering statues instead of the kid she was supposed to bump off. It’s a shame since she would have succeeded in her mission otherwise. Speaking of which, the teenager subplot didn’t actually become much of a focus for a while ad just went into the same old directions. Surprisingly they didn’t pull a “Let’s make him/her jealous” angle or anything like that, but it still happened in a way as the main guy (Well, there are 2 leads here. The one with the inheritance and the son/nephew. Both get comparable amounts of screen time so you can really choose who the lead is.) goes for Sinistra over the girl he was already with just because she looked nice. Honestly, there is absolutely no sense of loyalty in any of these beach movies. The film barely even has time to touch on any of this stuff since it turns into more of an Abbott and Costello kind of dynamic as the ghosts keep picking on one of them while the other doesn’t notice. The ghosts were definitely having quite a bit of fun in this film and why not right? They have to do something to amuse themselves. Then we also have Eric Von Zipper and his cronies in the final main plot. (At least the final one worth mentioning. We also have the heroine sulking in the pajama party segment where we get a song or two, but there’s not much point to that plot) Basically they want to get rich quick so breaking into the mansion just makes sense. They fight with a lot of the mechanical puppets and even end up face to face with a large gorilla. That part was rather random but definitely interesting I guess. It was like having a mini Kaiju show up in the film. Eric Von Zipper and the gang are basically the same as always so you’ll know right away if you like the characters or not. At the very least they keep everyone honest. Overall, This film is definitely a very confused one. It’s not exactly sure what it wants to do with itself and that can be rather tragic at times. There is a whole lot of potential here and the movie just squanders it all. The characters are rather weak and you can’t say much for the story either. While parts of the film can be fun, it’s just not enough to carry the whole thing. If you find that you have to watch a beach movie of sorts at some point then I’d recommend this one. Otherwise I’d say it is in your best interests to just skip this movie. It’s a decent supernatural comedy but you can find better ones on the market. 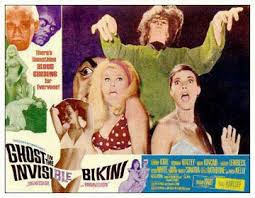 This entry was posted in Live Action Movie Reviews, Live Action Movies, Reviews and tagged Beach Party, Comedy, Drama, Film Review, Ghosts, Movie Review, Review, Romance, Sequel, Spirit, The Ghost in the Invisible Bikini by dreager1. Bookmark the permalink.